There had been a short break in the rainy weather the Bay Area had been getting for the past several months, so much so that moss is starting to grow around the neighborhood in places I've never seen it before. Today was sunny and almost warm - too nice to spend it indoors. The snows in the Sierra weren't going to be at all consolidated so I decided to hike locally, taking in the green hills around the Bay Area. And the next day was to bring more rain, so the window was short, indeed. Skyline Blvd is the Bay Area's minature version of the Angeles Crest Highway, 35 miles along the crest of the Santa Cruz Mtns. Windy Hill, a peak on the CC list, is a short hike from the highway and hardly worth the trouble of driving the hour it takes to reach it. I searched around for a list of other named peaks in the area and came up with a handful of them. None of them involved any significant distance or elevation gain, but some were on private property that might or might not be possible to reach - that should help keep things interesting. After driving to Skyline Blvd via Page Mill Rd, my first stop was Mt. Melville. There was no discernable reason why it should be graced with the title "Mount" when in fact it was just a hill like its neighbors (more suitably named "Hill", in most cases). The peak lies a quarter mile from the road in the Coal Creek Regional Open Space Preserve (OSP) though there is no trail to the summit. Off Rapley Ranch Rd there is an unnamed road that circles around the west and south sides of the summit, rising to a higher hill to the south. I drove this road to its end, only to find it goes to a home built atop this other unnamed summit and nowhere else. No turnouts, no trailheads. Back down I went. I found a small grassy place to pull over next to a gate shortly before Rapley Ranch Rd. This area with an old wooden building was part of the OSP but closed behind the gate. On the other side was Melville, and it was a simple matter of climbing the grassy slopes to the top while avoiding some brush, taking all of ten minutes. More than half of the view from the summit was blocked by tall trees, but one could still identify a few surrounding summits including Black Mtn to the east, Langley Hill to the southwest, and of course that house looking down on me from the south. Next up was Langley Hill, a short drive south once I got back on Rapley Ranch Rd. There is a gravel quarry on the north side of the hill that has blemished the view from that side, digging out a good chunk of earth from it over the years. It appeared the quarry was inactive as I drove by, making my way around to the east side of the hill. The peak looks to lie on private property, possibly part of the quarry, possibly another landowner. In any event, the barbed wire fences alongside the road were in disrepair and it would be an easy manner to walk over or through in any of a dozen places. It took another ten minutes to climb the steep slope up to the lower summit of Langley overlooking the quarry. A Private Property sign located here suggests there are several landowners on various flanks of this hill. Langley is composed of three rounded hills, the westernmost one being the highest. Looking towards the other two summits, I noted a small herd of deer, perhaps 10 in all, spooked by my presence and making their way up and over the western summit. I traversed all three summits to be sure I had reached Langley Hill, but the western point had the best views in addition to the extra elevation to give it the nod. A nice surprise I found was an old bench overlooking the view to the west and I spent about ten minutes making good use of it. 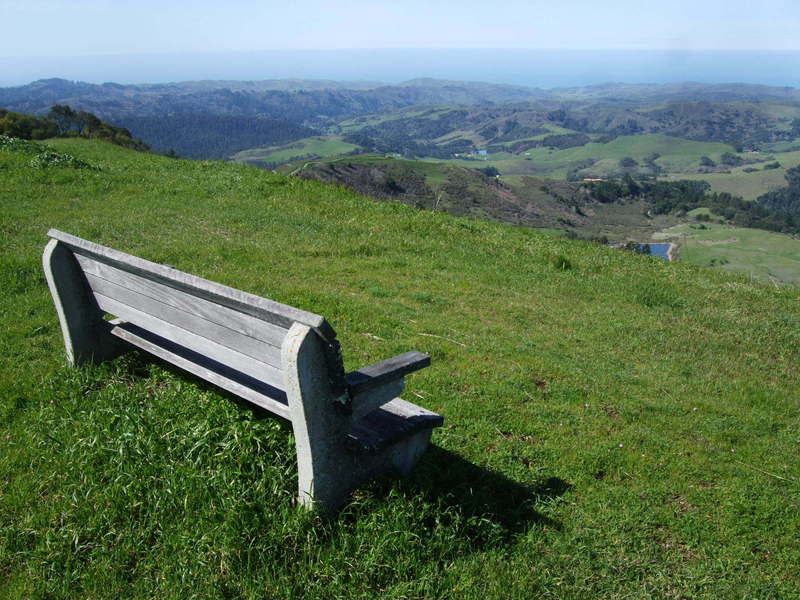 The bench has a fine view of the Pacific to one's left, and the Bay Area to the right. Green pasturelands swept down and away towards the west, filling the space between the two large bodies of water - it was a grand scene, best appreciated during the greens of Spring. Only a few varieties of flowers had begun to unfold over the hills, none of them yet in large quantities. A few more weeks will probably bring more color to the hills. Returning via a similar route to the car, I drove back out to Skyline and continued north. I stopped at the TH for Windy Hill, a prominent summit from the Peninsula and South Bay, but just a small bump on the ridgeline from where I stood. The prominence I describe is not the usual definition based on elevation, but the unusual amount of grassy slopes with few trees found on the Bay side of the summit, making it stand out from a distance. I followed the Anniversary Trail for the half mile distance to the highpoint. Like Langley, Windy Hill has three rounded summits, and again the westernmost one is the highpoint. There is a 1975 benchmark here, a nearby reference mark, and more fine views. Here the Bay is spread out without obstructions in a sweep of 180 degrees. There was no wind and only modest haze, allowing one to take in vistas of San Francisco, Oakland, and San Jose, surrounded by the summits of Mt. Tamalpais, Mt. Diablo, and Mt. Hamilton behind them, respectively. Returning to the car, I repositioned it a short distance further north at the next large trailhead parking on the right side of the road. Up to now, the summits had been enjoyable despite being easy, with views that were much better than I'd expected and no issues for access. From here, things began to take a turn towards the sillier side of peakbagging. Immediately west of Windy Hill is a small, indistinct grassy bump named Kelly Hill. It is hard to look at it seriously as anything other than some landowner's fancy to name part of his property after a sweetheart. It lies upon private property, just left of the road, perhaps a five minute walk. Between the road and the grassy slopes runs a 12-foot high, 20-foot wide swath of thickets with a barbed-wire fence embedded in the middle, combining to make a formidable barrier to the casual trespasser. I found a partial break in the brush and found my way to the fence where I hesitated a minute to figure out how to get over the thing, branches and spikey thorns thrusting out and over the fence and making it decidedly uninviting. I heard a vehicle pull over to the side of the road behind me and turned to look. Though indistinct through the thicket, I could see "Park Ranger" emblazoned on the front fender. Uh-oh. The white truck with green trim had parked on the opposite side of the road perhaps 50ft from me. I stopped dead in my tracks, quickly convincing myself that it was unlikely he pulled over because of me. Though not invisible, I was well hidden and probably unnoticeable unless I moved about or made much noise. Noise would have been the easiest thing to make as I was standing amidst a bunch of dead branches in the center of the brush, and I did my best to stand perfectly still. I could hear the radio inside the truck, but did not hear the door open. What were they doing there? A few minutes went by and I only managed to relieve my leg muscles by finding a more comfortable way to stand when another vehicle would drive by to mask whatever noise I would make. A look at my watch showed it was not long before noon. Perhaps the ranger was stopping for lunch? Gads, how long would that take - half an hour, an hour? I was feeling like a trapped rat. Of course I hadn't done anything wrong - yet - but I hesitated to reveal my location more from embarassment at this point than anything else. How do I explain what I was doing in the middle of the thicket on the wrong side of the road? I had no plausible excuse I could think of. As other motorists would drive by every few minutes, I took the opportunity of the distraction to reposition myself and eventually sit down. This was initially rather uncomfortable as I found myself sitting on some thorny brambles, having to wait for yet another car to come by to relieve me of that painful position. I followed the inside track of the brush wall to hide me from view to passing cars on the other side. This only worked for about 50yds until I had to hike up the grass slope, exposing me to the view. It seemed silly, but I worried about someone spotting me and imagined an armed posse coming out to protect the land from invaders. There weren't even that many cars coming by during the weekday - what were the odds that the few passing motorists would be a law enforcement officer or a landowner? With renewed confidence I climbed the hill, surveying the terrain to locate the summit of Kelly Hill. The GPS was indispensible for this task since it wasn't the highest hill around the area at all. A blue truck came driving around the corner, but I didn't turn to look. Then I heard it slow down and pull over about 100yds away. It wasn't possible - I'd already mentally put the odds as too low to worry about. A guy got out and shouted out to me, "Hey, you there!" I couldn't believe it - busted. I turned to acknowledge his call, which had no tone of anger in it. He then continued, "The Open Space is on the other side of the road. This is all private property on this side." This guy was too nice. I don't think I would have had the same patience. Acknowledging his warning, I called back, "Oh, I'm sorry!" and turned to head back down. "No problem. Have a nice day!" he called back before getting in his truck to drive away. What a swell man, I thought as I paused to consider his friendly way of handling that. Still, I wanted to get to the top of Kelly Hill, SOB that I was. So after affirming with the GPS that the near hill was the summit and glancing quickly up and down the road, I made a dash for the summit, took a few hasty photographs, and beat a path through the tall grass towards the road in all of a few minutes. This really was a silly hobby. The 7.5' topo map shows a water tank atop the summit, but all that remained was some of the old plumbing. Returning, I continued north on Skyline looking for the next two easy summits on my crude map that I had drawn on the back of a spent envelope a few hours earlier. Skeggs Point turned out to be nothing more than an overlook alongside the road, and I scratched that from my list. On the other side of road lay Sierra Morena in the El Corte de Madera Creek OSP. The direct route as indicated by the GPS was impossible as a cliff had been cut in the side of the hill to make room for the road there. But a short ways north along the road from Skeggs Point was a trailhead into the preserve. A gated road on the eastern side of the turnout led up to Sierra Morena. Though a summit of sorts could be found, it was completely surrounded by trees that afforded no views at all. The best that could be said for it was that I didn't have to plow through poison oak to get to it, which in the Santa Cruz Range is actually saying something, I think. Back at the car, I decided that was the second strike, but I still had two peaks on my list. Teague Hill was located a short distance away in the Teague Hill Regional OSP, and the only one that had any hiking of note, though only a few miles. You would think that with the OSP named after the summit it might have a prominent place in the hiking trails about the place, but not so, I found. Online I had read that to visit Teague Hill one needs to start at the Skyline Trail, a quarter mile south on Kings Mtn Rd off Skyline Blvd. I found this trailhead easily enough amongst a shaded grove of redwood trees on the east side of the road. The trail contours around the higher ridgecrest west of Teague Hill, on the shady northern aspect. It's a nice enough hike through second growth redwood forest, but offers no views at all except occasional glimpses now and then. I had hiked about a mile along the trail when I first suspected, then confirmed with the GPS that the trail does not go over Teague Hill. Rats. I backtracked to where the trail passes under some overhead high tension lines to find the subsidiary ridge that runs SE towards Teague Hill. It would have been darn near impossible to hike through the tangled undergrowth along this ridge if I hadn't happened to stumble upon an unmarked trail running along the crest of the ridge. How convenient! It was nicely groomed, running directly under the power lines, and I guessed it might be maintained by PG&E to access a tower a short distance along the ridgeline. Coming upon the tower, but still a quarter mile from my target, I was happy to find the trail continued on the other side of the structure. Just past it, I found a branch in the trail, much to my further surprise. These were not animal or use trails - someone, or some group, had made very decent trails through the OSP but neglected to mark them or mention them anywhere. Perhaps they were building a network of trails before opening them to the public? My GPS would not work in this area of heavy forestation and I had to guess as to which fork to take. I took the one heading left as it seemed to be staying higher than the other that seemed to follow the power lines down the slope. I followed this second unmarked trail for some time until I was pretty sure I was past my mark. I found a small clearing that allowed me to get a signal enough on the GPS to see that I had overshot by a quarter mile. Going back and studying the terrain carefully, I concluded that there is no discernable summit to Teague Hill as it is virtually impossible to determine a highpoint among this slightly undulating ridgeline loaded with trees and undergrowth. I did manage to find a small rock outcrop just off the trail about a tenth of a mile west of the summit (as determined by the GPS), but it was hardly satisfying. Oh well. It was just past 1:30p when I got back to the car and I had to leave the last peak on my list (Kings Mtn) for another time, as I had to get back to San Jose in time to get the kids from school. I had no reason to believe the summit of Kings would be any different than Teague Hill as they both looked equally crowded with forest when viewed from Google Maps. And with three strikes on the last three summits, I was happy to leave it for some future date.